The first thing you should do is nothing! 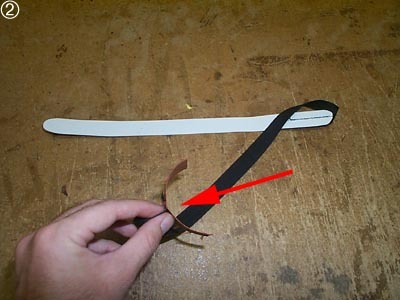 Don’t even remove the old straps, because you can use them as a threader instead of having to make one yourself. 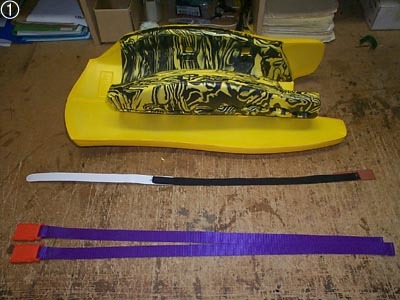 If you’ve already removed the old straps then you’ll need to follow the steps outlined below. 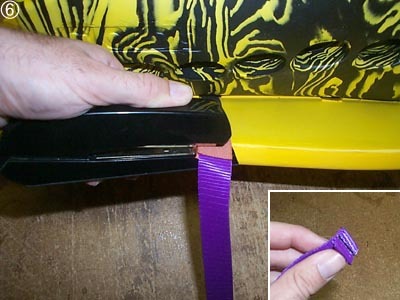 Otherwise, remove the male component of the clip from one end of the strap and cut the buckle off the other, without removing the straps from the legguards. Then all you need to do is staple your new straps onto the old ones and pull them through. Have a look at steps 6-8 below. It doesn’t get much easier than that! 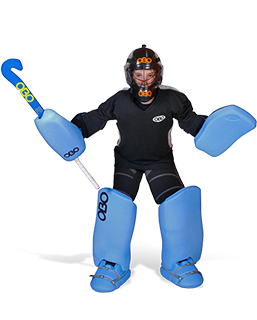 Here’s what you need: a legguard of course, your new set of straps and a device to help you get those straps through those channels. 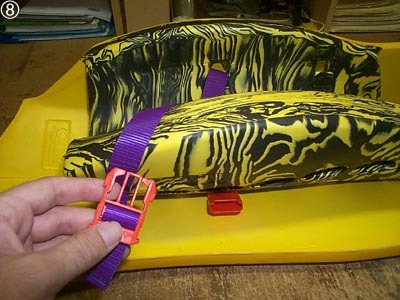 Note that both male and female components of the clip are at one end of the strap. 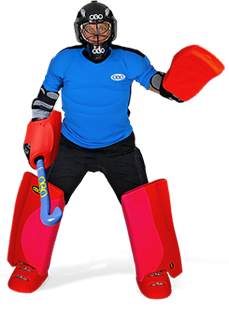 This is what we use at the OBO factory…. a threader! 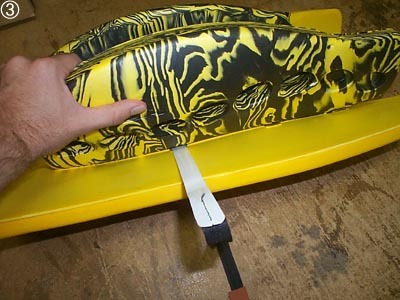 It’s a piece of flexible plastic, flexible enough to easily pass through the curved shape of the channel, but not so flexible that it snaps on you when you are half way through the process. We’ve sewn a piece of black nylon webbing onto the plastic. We’ve then sewn a piece of terracotta fabric to the black webbing. 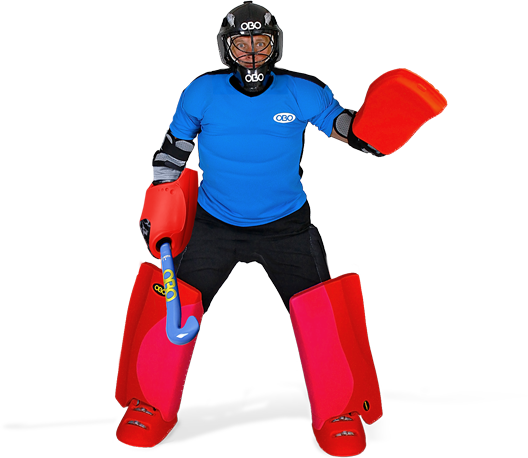 The legguard strap is then placed between the two ends of the terracotta fabric as shown by the red arrow.  This helps the strap travel relatively easily through the channel. The reason we use a plastic threader is because we need to thread hundreds of legguards. 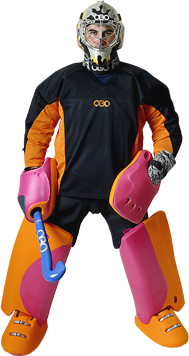 To thread a single legguard Jon O’Haire reckons a piece of 1″ cardboard with a pointy end will do the trick. 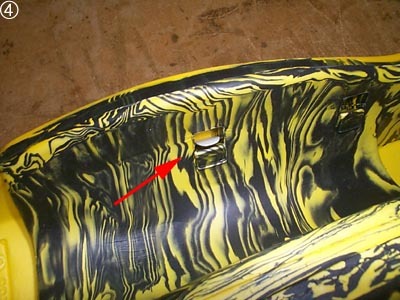 Thread the plastic all the way through the channel until the tip of the threader appears at the channel exit as shown by the red arrow. You may need to assist the threader through the exit with a finger. Pull the threader almost all the way through the channel. 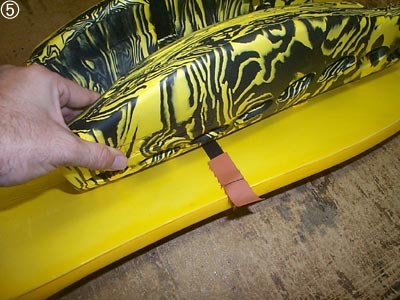 Leave enough of the black webbing and terracotta fabric showing outside the channel so that you can attach the legguard strap to the threader. 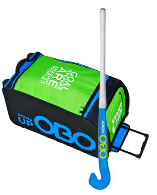 Pull the rest of the threader, with legguard strap attached, gently through the channel. 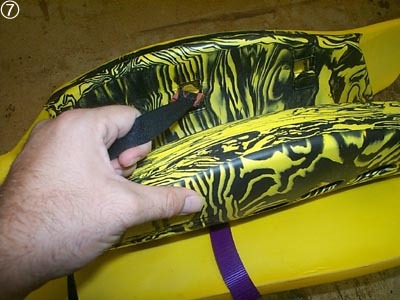 If you go too fast the strap will probably come off the threader part way through the channel. You can just see the end of the strap exiting the channel in the image above. All that remains is to attach the male component of the clip to the other end of the strap. That’s it, real easy, especially after you’ve done several hundred like we have at the OBO factory!